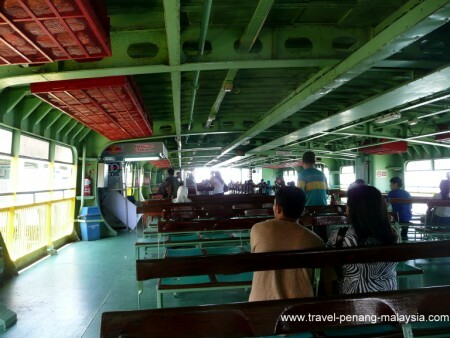 If you are travelling overland to Penang, then you will probably use the Penang Ferry (Feri Pulau Pinang) which runs between Butterworth on mainland Malaysia, to Georgetown on Penang Island. The first ferry from Butterworth to George Town is at 05:20 am. The last ferry to Penang is at 00:10 am. The first ferry from Penang Island to Butterworth is at 05:40 am. The last ferry to Butterworth is at 00:40 am. The Penang ferry runs approximately every 20 to 30 minutes (you never have to wait too long) and takes about 15 to 20 minutes to cover the 3 km distance. After 10 pm, there are less frequent boats, with just one departure every 60 minutes. Penang Side: 04 261 0290 / 210 2363 (duty officer). Butterworth Side: 04 331 2796 / 310 2377 (duty officer). How much is the Penang Butterworth Ferry? You only have to pay for the ferry to Penang Island. There is no charge for the return journey back to Butterworth. Want to find the newest places to stay in Penang? Foot passengers now have to buy ferry tickets from the ticket counter. You then have to scan your ticket on top of the turnstile to enter the waiting area. The Pangkalan Sultan Abdul Halim Ferry Terminal in Butterworth is located next to Butterworth train station and the bus station and is part of the Penang Sentral transport hub (recently opened at the end of 2018). If you are arriving by train, keep to your left after leaving the station's main entrance and follow the signs (you now reach the ferry terminal via the new Penang Sentral building). It will only take you around five minutes walk to get to the jetty. The bus terminal is now located under Penang Sentral. If you have just arrived on the train from Thailand you will need your first Malaysian money here. Ferries depart from the Pangkalan Raja Tun Uda Ferry Terminal in George Town at Weld Quay, otherwise known just as the Penang Jetty (Jeti Pulau Pinang). From here you can catch a bus to anywhere on the island as the Rapid Penang Jetty Bus Terminal is on both your right and left as you exit the ferry area. If you need any help about which bus to catch, just ask at the bus terminal information office. You can also catch the "Free Cat" Penang bus from here. This free bus service takes you around the old part of Georgetown past many of the George Town Hotels and then on to KOMTAR Bus Terminal. The free Penang bus now leaves from the new Terminal B, on the left-hand side as you come down from the ferry. They leave every 15 minutes or so. 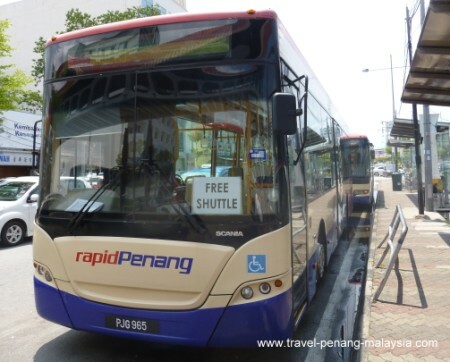 If you want to travel by bus from the Penang ferry jetty to Batu Ferringhi beach, take bus 101 which leaves from terminal B every 10 minutes or so and is by far the cheapest way to get out to Penang's beaches. There are many Taxi drivers here also if you need one. Or you can walk the short distance into town where you will find many hotels and guesthouses in the Chulia Street area. Chulia Street (Lebuh Chulia) starts a couple of minutes walk away from the exit of the ferry terminal on your left. Just walk along here for five minutes, on the edge of Little India and past the Kapitan Keling Mosque. After the mosque is where you will find most of the accommodation, either along Chulia St, Love Lane and Muntri Street. At the end of Lebuh Chulia is where you will find Penang Road (Jalan Penang), which is a popular tourist area with many hotels, shops, restaurants and the main nightlife area of the city. There are a few places to stay within a few minutes walk of the ferry with both budget and luxury accommodation nearby. If you want to stay over on the mainland, there are not that many places to stay compared to the island, but there are a few relatively cheap places within 10 to 20 minutes walk of the ferry terminal that will do for a night if you want to catch an early bus or train.